Recently Samsung announced its new series of Blu-ray players with support IP TV Netflix. That’s really cool to have one device to watch DVD/Blu-ray disks and online TV. 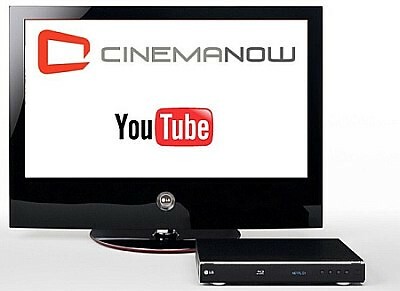 Additionally to that LG decided to add possibility to watch YouTube and CinemaNow videos on its next gen decks. The new device will be demonstrate January 7 in Las Vegas and more details will come. If you’re owner of HTPC with Video Disk Recorder (VDR) and have enough interesting recorded media content you might use vdrtube to share it similar way as it’s done with YouTube. That VDR plug-in adopt video to display in Flash-player and build HTML structure to access it via web browser. Plug-in allows to create themes. So, you can customize YourTube according to your desire. Also, there is a possibility to control access to your media content using Apache authorization functionality. Plug-in vdrtube is developed on Perl. It’ll be pretty easy to modify it if you don’t satisfy its work. Actually, it’s a good possibility to share your video between relatives or friends. But personally I prefer to have plug-in which allows to watch YouTube video on TV using VDR or MythTV. But currently as I know only Windows MCE offers such feature. YouTube is coming to be a standart de-facto for as online stream video (It’s a funny place. You can spend there all your working day). YouTubeMCE plugin for Microsoft Media Center can be a visual proof this thesis. It allows to search YouTube videos, sort, and browse personal favorites. YouTubeMCE also kindly provides video thumbnails for selections and even offers two choices for watching videos: YouTube’s default player (embedded) or Fullscreen. Have a fun!